Heavy rainfall hit Istanbul Thursday, flooding streets causing disruption to public transport, canceling flights and leaving people stranded while trying to get back to their homes during the evening rush hour. 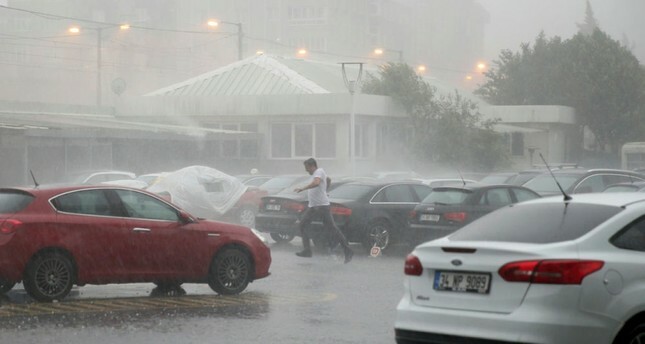 Images shared on social media and Turkish television showed huge hailstones battering the streets of Turkey's most populated city and cars submerged in the torrential downpour. Flights at Istanbul Atatürk International Airport were canceled and metro services were suspended, officials said. A large crane overturned at the Haydarpaşa Port, starting an explosion and a subsequent fire that was later brought under control. The city's tram service between the Bağcılar suburb to Kabataş on the banks of the Bosporus was also suspended. Authorities also closed down the Eurasia Tunnel, which connects Istanbul's Asian and European sides under the Bosporus strait, as a precaution. An old cemetery wall adjacent to a busy street collapsed in Kurtuluş neighborhood of Şişli district, wounding at least two people. Additionally, a fire erupted after a lightning stroke a depot in the Kağıthane district. The municipality previously warned that on average 50 millimeters of rain would fall. Many buildings and offices were flooded as hailstones as big as paintballs shattered windows of cars and residential buildings. It was the second time in 10 days that heavy rainfall inundated streets and wreaked havoc.